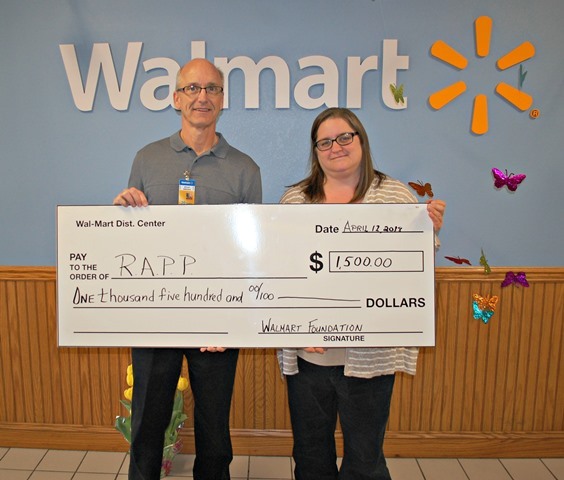 CLEARFIELD – The Relatives as Parents Program of Children’s Aid Society recently received a $1,500 grant from The Wal-Mart Foundation. Pictured are Brian Rosenberger, general manager of the Wal-Mart Distribution Center No. 6027, and Christina Woodel, Relatives As Parents Program manager. RAPP is designed to assist grandparents and other relatives who have taken on the role of primary caregiver for related children. The program is offered in Clearfield and Coalport. For information, call 814-765-2686, Ext. 236 or e-mail rapp@childaid.org.